Our friend Andrew otherwise known as Killer Rin went to the Xbox One truck tour and has come back with pictures, video and a written impression on what he thought about the console, controller and games at the event. Before continuing into his impressions below you can also check out his impressions on our podcast (Episode 14: Halo's Destiny) at 53 minutes for a little more of what he thought once he made it back from the event. Also a shout out to our Windows Phone 8 users all the videos and pictures were taken with Lumia 920. Without further wait, take it away Andrew. 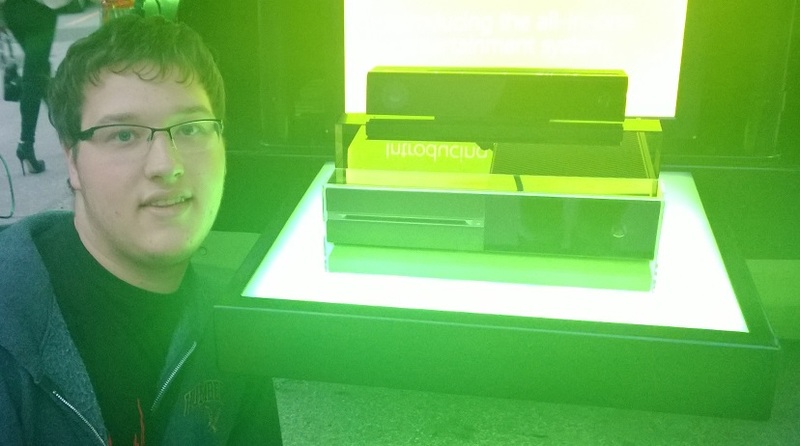 On Saturday October 5th, 2013 the Xbox One Trucks made their way to Toronto Canada, parking at the Air Canada Center and running demos from between 4-7pm. Leaving my house in the morning, I arrived at around 5:45 where I stayed until 7:20 when they shut the event down for the day. When I had arrived, the truck was relatively busy, around 30 or so people (mostly guys, but there were a good portion of women too) who were mostly crowded around the Killer Instinct stations, many people choosing to play multiple rounds before handing off the controller. In general though, people were mostly hanging around, talking about the next generation of consoles while waiting for their chance to play and while the people in charge of the Xbox One Truck were talking up the positives of the console for people who were interested in learning more. In general you could feel the excitement in the air, people were laughing and having fun. During the event I was able to overhear several people walking up to the event coordinators asking them things like when the console came out, the price and where they could buy it. Interestingly enough, there were guys who had brought their wives to the event trying to convince them to allow them to purchase it, some of those wives buckling once they heard about Xbox Fitness and the Television integration. During the time I was there, I’d have to say that around 300+ different people had stopped by to play. Dead center at the back of the Xbox One Truck was the console, Kinect and a controller for viewing. Looking at the console in person, it looks a lot smaller than what is portrayed in the various videos and pictures around the internet. In total it looks only about a little larger than the current 360S model. The console itself was locked down under a clear plastic box though so I wasn’t able to get a feel of the device, but I assume it feels like the Kinect. One of the most controversial changes is the thumb sticks. The thumb sticks themselves have been decreased in height making them flusher with the controller. Despite what I have read people saying that they feel cheap or like the vitas or the 3DS’ thumb sticks, I have to say that I wasn’t able to see that as they feel completely different than both of those. In terms of tension, the thumb sticks have slightly more tension than a brand new Xbox 360 controller and in my opinion feel just right whereas with the 360 controller something had always felt off about the tension to me. Lastly the grips on the tips of the thumb stick were able to easily keep my thumb on them without much effort. When using the controller my thumb was firmly in place and I was always able to tell exactly which position the stick was in just by the grips alone. Onto the bumpers and triggers, while in images they look like a single piece of plastic but upon closer examination I was able to see that they are in fact two separate pieces of plastic. They are angled in such a way that you are able to quickly and easily slide your index fingers between the bumpers and triggers without much effort. With the One Controller, the bumpers have become clickier which felt nice, but one thing I’m neutral on is how they have reduced the tension on the triggers. While the decreased tension wasn’t enough to bother me outright, I can see how it can effect games which require more precision with the triggers. Before I get into this, I really do want to iterate that these experiences will change when release comes around. The console is still running beta software and is still very much buggy. Now getting into this, while we weren’t allowed to view the dashboard, I and the people I was with took some time to look around the dashboard when the event coordinators weren’t looking. In general for the dashboard you could navigate sections on the home screen via the bumpers and control the selector on the current home screen section using either the d-pad or left thumb stick in conjunction with the A or B buttons to select or go back. Because the dashboard is pre-release the entire thing felt unintuitive. In some menus you could press B to back out whereas in others such as Settings or Sign In you had to press the guide to go back. From what I noticed, I didn’t see a way to change the color of the tiles, but I’m still assuming that they will have that option come release. Other than this though, In terms of the layout, I like it. In the main menu it will show what game/app you are currently running in addition to the snapped app on the side right next to it. Right underneath the main panel is a list of the recently opened applications. As we went through the dashboard opening up various apps, the previous app would get put into this menu until it reached the end and disappeared. Now I have a confession to make, I have never played a Forza game in my life before this, but after playing Forza 5, it quickly became a favorite of mine and will be one for me to pick up once the Xbox One comes out. For Forza 5, we were limited to one level, Mazda Laguna Seca, a desert track which was surrounded by walls, buildings and tents. The level itself had some of the most realistic lighting I have ever seen in a game such as when going into or out of a tunnel and when facing the sun. It just seemed real. The controls for Forza 5 were simple, RT to accelerate, LT to reverse, A is your handbrake, Right Thumb stick to turn the camera, Left Thumb Stick to turn the car and if you really screwed up, press Y to rewind. It was simple, but fun to play once you got the hang of taking turns and figuring out how to bypass your opponents. The big thing with Forza while at the event was how it utilized the Rumble triggers. While during Killer Instinct, I didn’t notice them, they were one of the main features in Forza 5. Forza 5 took every single condition which you were dealing with and applied that to the rumble which went into the triggers. While playing every rumble felt different as it took into account your speed, if you were turning and how you were turning, if you were braking, whether you were on track or not and even the damage to your vehicle. It really did feel as if you were driving the car and really helped to sell both the feature and the game. As another confession, I’m not a huge fan of fighting games, and that didn’t change after playing Killer Instinct. To be honestly fair, it’s just not the game for me. I lost every time and couldn’t land more than a couple hits on everyone I played against combined. I’m sure it’s a fun game, but it’s just not my type of game. With that out of the way though, the game looks beautiful from the foreground all the way to the background. Particle effects were plenty in this game and just fun to look at in general. Every character had their own special attack which seemed to fit with their theme and everything was really fluid. The Controls for Killer Instinct 3 were relatively simply with the face buttons being used for your attacks, the D-pad and Left Thumb stick being used to move and the triggers emulating the face buttons. In addition to this, there were button combinations which allowed your characters to do even more special moves such as throwing a fireball or whatnot. I hope you enjoyed the article and I know Andrew enjoyed his time at the Xbox One Event, if you have any questions please leave a comment below. Older Post21 New Cars Announced For Forza Motorsport 5!